Cold Tofu Improv’s next show will take place on Saturday, Feb. 20, at 7:30 p.m. at St. Francis Xavier Chapel/Maryknoll Japanese Catholic Center, 222 S. Hewitt St. (between Third and Second streets) in Los Angeles. 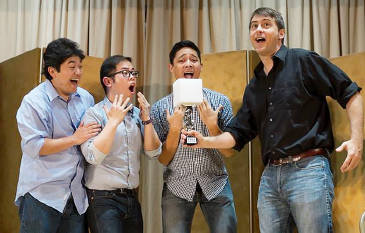 The nation’s premier Asian American comedy improv and sketch group celebrates the leap year this month. Every four years, the Gregorian calendar is set straight by adding one full day on Feb. 29. It is one extra day that is unlike any other. Irish women propose marriage to their sweethearts, newborn babies gain membership to The Honor Society of Leap Year Day Babies, and rapper Ja Rule finally gets to celebrate his birthday. Everyone looks forward to their special day when anything can happen. What will you do with your extra day? Cold Tofu Improv will show you the possibilities. Featuring Corinne Chooey, Jhemon Lee, Johnny Ye, Julio Urquidi, Michael Palma, Shanon Wong and Tony Garbanzos. Running time: Approximately 80 minutes with 10-minute intermission. Raffle drawing at the end of the show for goodie bags, gift cards and Hello Kitty merchandise. Free raffle ticket with each admission. Note: Valet parking available at St. Francis Xavier Catholic Center for $5 with Cold Tofu validation. Enter from Third Street and pay $10 parking fee in advance. Get $5 reimbursement with validation upon exit. Cost is $7 at the door. Online reservations can be made at www.brownpapertickets.com.